There are several very good books on the basics of Scrimshaw so I won’t go into detail on how to get started. “Scrimshaw Techniques” by Jim Stevens is perfect for beginners. It provides a detailed description of what’s needed and how to start out. I would strongly recommend reading this or similar books and practicing until you get the basics. When you first start it may seem impossible, but then you will get the hang of what to do and you will get better and faster. All of these books can be bought through Amazon. 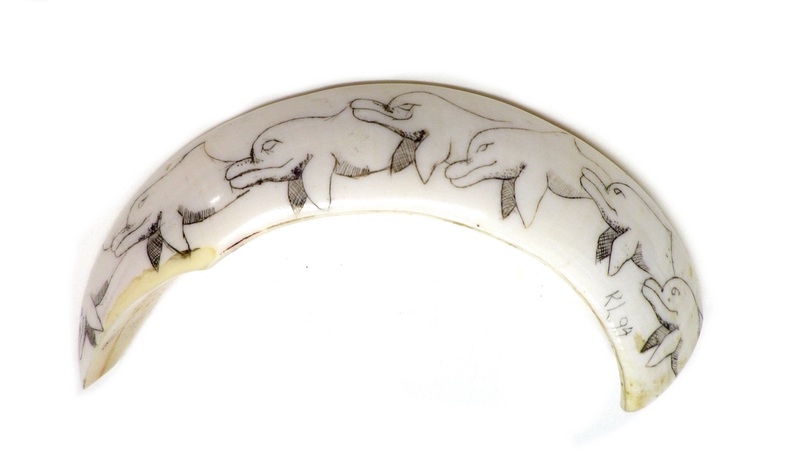 My first Scrimshaw was on a pigs tusk. I Scrimshawed dolphin heads onto it and I found it impossible because the scribe kept slipping and sliding off the surface. I then realised that pig tusks, like hippo tusks, have a hard enamel layer on the outside that will strike a spark if hit with steel. Once I sanded the enamel off, the ivory underneath was easy to Scrimshaw. My advice is buy one of these books study it and then start your scrimshaw, you’ll save a lot of time and frustration. “Scrimshaw Techniques” by Jim Stevens. “Scrimshaw? But I Can’t Draw! How to Scrimshaw Volume 1” by Andrew Perkins (The comment I hear over and over is “I cant draw so I would never be able to do Scrimshaw” If that’s how you feel then Andrews book is for you. Andrew gently encourages the reader to give it a go with simple step by step lessons. Highly recommended for the beginner. There are other books about learning Scrimshaw but these are the main ones and they all cover the same details in different ways. YouTube is also a good place to learn. There are some good beginner’s videos and some excellent tutorials by David Adams. Check out Andrew Perkins at www.scrimshaw.com. Andrew works tirelessly to help answer all your questions on Scrimshaw. Also check out Jim Stevens at www.scrimshawstudio.com. Jim discusses all things to do with Scrimshaw. If you want to see some of the very best scrimshaw by the worlds best scrimshaw artists, go to www.scrimshawgallery.com. There’s no shortcut when learning Scrimshaw so once you’ve read the books, keep practicing. Most Scrimshaw artists do it for a living, so for them, learning the tips and tricks is vital. Others like me do it as a hobby.